I admit it – some of those infographic “résumés” look pretty impressive. But do they really work? To answer that, you need to understand the job application process because this determines how well your document will perform. If you’re like many jobseekers, you’re probably applying to jobs online. That means, you mostly likely have to upload your résumé into one of the hundreds of computer applicant tracking software systems (ATS). The ATS is scores and ranks your résumé according to how well it matches the job posting. The higher the ranking, the better chance it has of being seen and selected for an interview. The lower ranking, the opposite happens. Your résumé is read first by the ATS and not a human. It’s the first unforgiving filter that your résumé must penetrate in the job application process. Some of the ATS systems are quite sophisticated and can interpret most documents and even understand synonyms and syntax. Less sophisticated systems can read only keywords, so their selection results are not ideal. 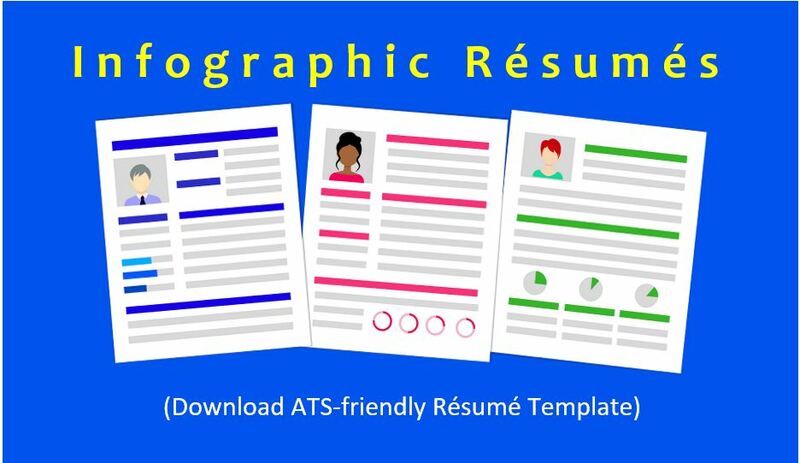 Sadly, Most résumés don’t make it past ATS because they were not written to be “ATS friendly”. The small percentage that are successful, are then subject to the second filter. The second filter is the human being which in this case is HR and/or the recruiter and/or the hiring manager. They have multiple elimination criteria and according to experts (and based on my professional experience), they reject way more than half of the résumés in order to drill down to a handful. The human reader is looking for a résumé that not only looks good, is easy to scan quickly, and makes sense, it must also give them a compelling reason to select you for the interview which goes beyond just listing your skills and experience. They’re looking for the kinds of solutions you’ve offered now or in the past that would address their needs. This is your value proposition and is achieved by including short and succinct career success stories in the résumé. This value proposition is something that can only be adequately expressed using a modern, combination format résumé – not a chronological, not a functional, and definitely not an infographic in my professional opinion. The way an infographic résumé is laid out and designed actually creates more problems than it solves. The computer systems generally don’t like heavy designed documents that contain images, icons, a lot of colour, graphics, special fonts, tables, columns, among other things. While some systems might be able to interpret them, many can not. If you use an infographic, it has a high chance of ending up with a low score and low ranking and therefore never seen by the human reader. Since you don’t know what system you are uploading your résumé into, it’s best to use a simply designed Word document in the requested format which is usually doc or docx and somEtimes a PDF. I wrote a blog about simple résumé design hacks you can read here. The general rule of thumb in résumé writing is to keep it simple, so definitely avoid the infographic when you apply to jobs online since you will most likely upload your résumé into an ATS. Even if you are emailing directly to a human, they don’t necessarily like infographics, either (see below). Even if the ATS systems can read your résumé and give it a favourable ranking (which is no guarantee), the bigger problem is the human reader. Any time an infographic résumé crosses my desk, I always roll my eyes and I know I’m not alone. The strong use of visualization rather than the written word might make it look “cool”, but it doesn’t contain enough of the critical details that are needed for me to decide if I want to invest time reaching out to the candidate to get more information or clarify something. I’m too busy. Remember, you are NOT the only qualified candidate and the employer has numerous other résumés to review which contain the information they want and need, so they will likely move onto the next résumé that gives them the details they are looking for. Even if they put your infographic résumé aside for follow-up later, they’ll probably forget because they’re busy and distracted. The result is, you miss out an opportunity all because you chose to not submit a full length résumé. As far as I’m concerned, an infographic résumé is NOT a résumé in the more traditional sense of the word. An infographic is really a one-paged networking document or giant business card that teases a little but doesn’t offer enough substance for the reader to make any meaningful determination. I mean, think about it. How can you sufficiently communicate the value of an entire career onto one page so that the employer can’t wait to contact you for an interview? You can’t. It’s only one page. It’s physically impossible. Do the math. An infographic is fine for in-person networking or even for marketing yourself online when you don’t know if there is a job available. However, even in networking situations you will still need a full length résumé if an organization has a position available and feels you could be a potential fit. When the job posting or person asks for a résumé, in 99.9% of the cases, they expect a full-length résumé and not an infographic, so don’t send them one. You will only be hurting your chances. Not sure if your current résumé is going to attract interviews or you don’t have a résumé and need one? Feel free to contact me here.